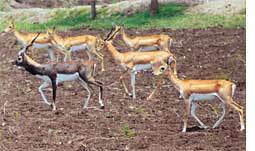 THE large population of blackbucks in Maharashtra's Aurangabad district have become a menace for farmers. Herds of bucks and deer have been grazing standing crops for the past five years. If the forest department is to be believed, the farmers will soon be rid of the problem: experts have been called in to trap the animals and transport them to a sanctuary 400 km away in Washim district. The plan is to identify the resting places of blackbucks and deer and snare them at night. The experts demonstrated their skills at a training session organized by the forest officials on May 19- 20. Six blackbucks and deer were taken by surprise with glaring lights and loud music. When the startled animals stood dazed, large nets were thrown over them. They were then hauled away to the Karanja Sohal sanctuary. "Kurnool district in Andhra Pradesh was facing the same problem.The experts led by assistant conservator of forests, K Tulsirao, used this method successfully to relocate deer," said S B Gaikwad, Aurangabad's assistant conservator of forests. He said the entire exercise would cost Rs 61 lakhs. "I have sent the proposal to the state government," Gaikwad said. Farmers are unsure if the plan will work. "We have suffered losses of more than Rs 10 crore. Last year in August when the farmers went on an indefinite fast, in the divisional commissioner's office, we were promised the animals would be shifted, but nothing happened," said Annasaheb Shinde, president of Blackbucks Affected Farmers' Action Committee. Shinde said farmers have stopped sowing legumes and sweet lime that attract blackbucks. Sometimes the herds chase farmers who are alone. Some wildlife experts are sceptical. "Aurangabad has over 4,000 blackbucks. Capturing and transporting all of them will be difficult," said Dileep Yardi, member of Maharashtra state wildlife board. It is possible to find grazing grounds for them locally and make food and water available to them with farmers' assistance, he added. "If Blackbucks and farmers can co-exist in Rajasthan, why can't it be so in Maharashtra?" Yardi asked.